Five races into the 2019 race season and we finally made it to a proper karting track, and what a track it was. The Musselman Honda Circuit in Tucson, Arizona is one of the most picturesque karting facilities in North America, surrounded by mountains with a challenging layout to suit. Hosting round two of the Challenge of the Americas, the event featured a smaller than expected turnout, especially after an impressive series opener at CalSpeed, but continued the championship momentum rolling in all eight classes on track. Like CalSpeed, the temperatures were very cool, but thankfully there was no rain in the forecast all weekend. So what happened at COA2 in Tucson? Here are our headlines from the race weekend. 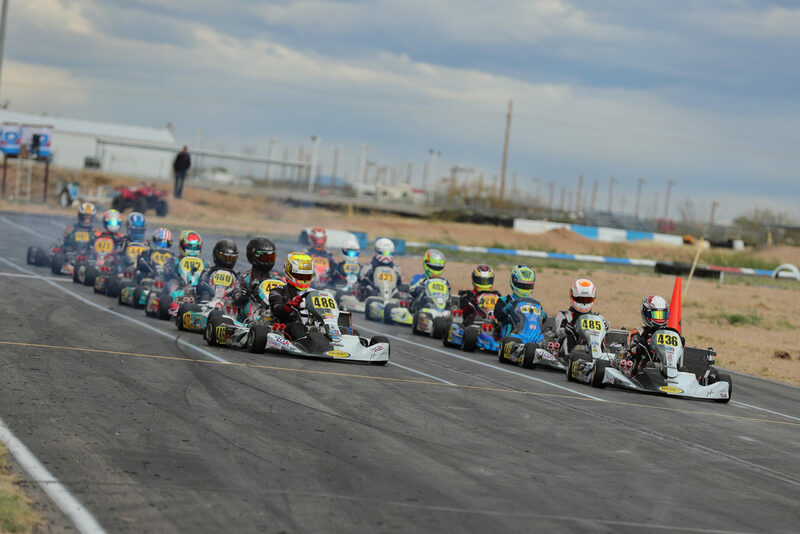 A GFC Kart led the way in every session of Rok Shifter Senior in Tucson except for one. Hunter Pickett was the team leader, qualifying on the pole position on Saturday, winning both Finals in dominant fashion and adding a PreFinal win on Sunday. Kol Bailey, a COA race winner last year, won the Saturday PreFinal and started on the front row for both Finals as he inches closer to a race win in 2019. Finally, the Gary Carlton brand finished the Sunday PreFinal with a 1-2-3 effort thanks to a strong run by Cole Shade. Four more podiums for GFC show that these guys are no joke when it comes to shifter racing. The only driver to top a session, not on a GFC Kart? The one and only Ron White in Sunday Qualifying. On Saturday, Ethan Ho was the driver to beat through Qualifying and the Prefinal, but when it came to the Final, the California driver was hounded by Macy Williams. Lap after lap, Williams remained on the rear bumper until three laps to go, overtaking in turn one. Ho fired right back and regained the lead in the next corner. Williams pulled off the same move again the next time by, but this time defended the pass and kept Ho at bay. Completing the next lap and a half perfectly, Williams celebrated the victory at the finish line. On Sunday, a great race was shaping up between the front four. William Letzsch and William Ferguson led the way, joined by Ho and Williams. But in this one, Ho worked his way from fourth to the lead, three times before making it stick. Leaving the trio to battle it out amongst themselves for the final two steps of the podium, he checked out and pulled out to a significant margin of victory. There was a sense of deja vu in Mini Rok on the weekend. While the location was different than the first round, the Final races were eerily similar. On Saturday, Logan Toke went to battle with Enzo Deligny and came out on top to score his second win of the year. The two were once again on Sunday, sharing the front row for the Final, but this time Deligny checked out early and pulled away, just like he did at CalSpeed, en route to the victory. Toke slipped back down the order just passed the halfway mark and settled for fifth. Anthony White was the hard charger, driving from the rear of the grid to second while Ian Qui, who is guided by BBR Karting’s Blake Choquer, scored a podium in his COA debut taking third. Two drivers continued to dominate their respective classes at COA. Italian driver Filippo Sala steered his Vemme Kart to his fourth straight victory in Micro Rok, maintaining his unbeaten streak. In Rok Shifter Masters, Rod Clinard was the man to beat all weekend, driving home his second and third victories of the season to open up a nice lead in the championship heading to the finale at Sonoma. By far the most dramatic category on track in Tucson was Rok Masters. These guys threw down the gauntlet each time they hit the track and provided the play-by-play announcer plenty to get excited about. On Saturday, Billy Cleavelin came away with the win after getting away from a battle between Nick De Graaf and Derek Wang. In the Sunday Final, Wang built up a big lead just before halfway when De Graaf, Cleavelin and Erik Jackson fought for second place. But with an intense headwind down the straight, De Graaf was able to get into the slipstream of Wang and catch him with two laps to go. Passing him before the finish, Wang was unable to retaliate and actually slipped back to third after Jackson got by on the final lap to make it a Vemme Kart 1-2. It’s been a few years since we’ve seen Wesley Boswell suit up and actually race. He works closely with Eddie Shimmon, coaching him in practice sessions but this weekend he decided to join in on the fun and race alongside his prospect. Showing no signs of rust, Boswell led every lap of the Saturday Final from the pole position to score the victory. Cooper Becklin and Canadian Jordan Redlin joined him on the podium as they overtook Colby Dubato in the late stages of the race. The following day Becklin drove to his second Sunday victory of the COA season after trading blows with Jake Drew. The two swapped the lead a number of times until Becklin finally broke free with less than five laps left. Jim McKinney took third while Boswell was fourth after starting tenth. Heading into Sunday, Colby Dubato was looking to extend his podium streak to four following three straight third-place finishes in 100cc Senior. Not only did he maintain his podium streak, but Dubato also drove home the race victory after ditching Logan Calderwood at halfway. The other driver looking for his fourth straight podium was Saturday winner Adam Kasick, but he fell to fifth on the final lap after battling with his Forward Direction Motorsports teammates Everest Fedler and Jackson Dunn. While his streak was snapped, he remains on top in the championship thanks to his two race victories. As the lone driver in 100cc Masters for the second straight event, Jimmy Gregory all but confirmed he will be the class champion in Sonoma. The third and final round of the 2019 Challenge of the Americas hits popular SimRaceway circuit in Sonoma, California on April 5-7 to close of their campaign. Champions will be crowned and CKN will be there to cover the action!